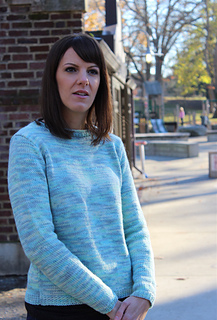 This basic crew neck pullover pattern is perfect for beginner knitters or anyone who wants to use self-patterning yarns, highly textured yarns, or any yarn that just needs to be the star of the show. The pattern’s blank canvas is also great for stripes or embroidered embellishments. Instructions included for four different yarn weights/gauges: sport, DK, worsted, and bulky.